Leonardo Fibonacci is a famous Italian mathematician, founder of a simple series of numbers that refer to ratios valid for natural proportions of things on the planet. These ratios appear from the next numbers: 0, 1, 1, 2, 3, 5, 8, 13, 21, 34, 55, 89, 144, 233, ..., and found while performing next calculations: 1+2=3, 2+3=5, 3+5=8 etc. If to measure the ratio of any number to one of the next higher number the result will be 0.618. For example, 21/34=0.618. If to measure the ratio between alternate numbers we will get 0.382. For example, 13/34 = 0.382. These proportions can be found in nature, science, architecture, music, art. A few examples of Fibonacci numbers are pine cones, sunflowers, pineapples, palm trees, spider webs, snail shells, DNA molecules and millions of other things in the universe. When applied on Forex charts, Fibonacci Retracement Levels are used as support and resistance levels: 0.236, 0.382, 0.500, 0.618, 0.764. 0.382, 0.500 and 0.618 — are the most important to watch for. 0.618, 1.000 and 1.618 — here are the most useful for traders. Fibonacci retracement and extension levels carry important information for experienced as well as novice Forex traders as they help to identify entry and exit points during the trade. This chapter will introduce traders to basic rules of applying Fibonacci method in Forex. And now let's get straight to the point. 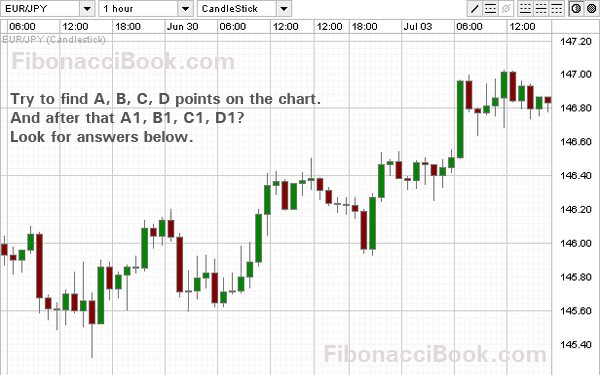 Where and how to use Fibonacci study on Forex charts? As you have noticed, there are some A, B, C, D points on the chart. They represent the highest spikes of the price moves or simply highest price swings. 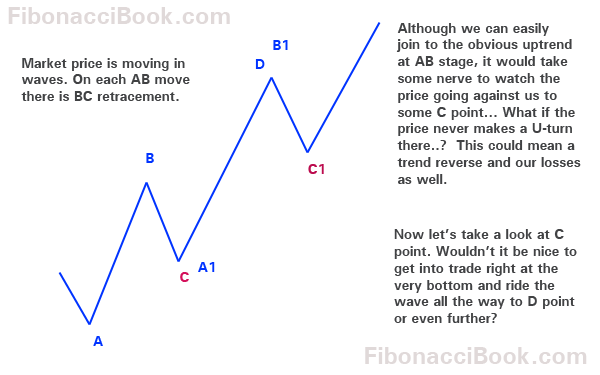 To apply Fibonacci study to the price moves we will always look for those points. How about a small assignment?..